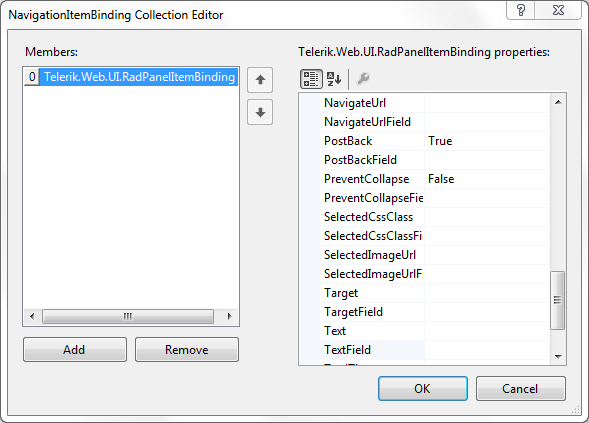 Right-click on the RadPanelBar control and choose Edit RadPanelBar Databindings from the context menu. From the RadPanelBar properties pane, click the ellipsis button next to the DataBindings property. Each item in the collection represents a set of data bindings between the data source and the items at a given level of the panel bar (root items, items at the first child level, and so on). You can also create an item that gives the default mapping to cover any levels not specificly mapped by another item. To add items to the collection, click the Add button, and set the item properties in the right hand pane of the dialog. To delete items from the collection, select the item and click the Remove button. Typically, for each RadPanelBarItem property, there are two properties for the data binding: one is a hard-coded property value that is assigned to all panel items to which the data binding applies, the other is the name of a field from the data source from which the property value can be taken. Thus, for example, the Text property and the TextField property both set the Text of a panel item, but the Text property sets the RadPanelItem text to a hard-coded string, while the TextField property maps it to a field from the data source. The Depth property indicates the level of panel items to which the data binding applies. If Depth is not set, the data binding applies to all panel items not mapped by another binding. The collection should contain only one item with no value assigned to the Depth property. The FormatString property specifies how to format the text supplied by the TextField of the data source. The DataMember property specifies the table from which to map items. This property lets you use different tables from the same DataSet to supply values at different levels of the panel bar.